It’s hard to argue with logic like that! That’s why islamic countries have no problems with transsexual men wanting to become women, but do have a problem with transsexual women wanting to become men. 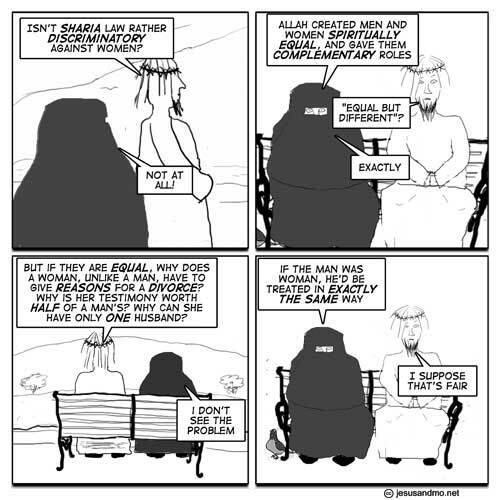 Because they are totally equal, it’s degrading for a man to become a woman, but okay if he wants to step down the ladder, but it’s infuriating to islamic men when a woman wants to be surgically altered into a man. She wants to sneak up te ladder when Allah has decreed that she was to be an inferior female. Talk about social climbing! And hey, it’s all totally fair, because if the transsexual men wanting to become a woman was a transsexual woman wanting to become a men, he would be treated just as the transsexual woman who wanted to become a man, and that’s totally the same and very equal and fair. Right? A fine example of religious reasoning. Do men usually wear a burka? Maybe Mo is trangendered???? funny that Mo dresses as a modest woman while he’s promoting the arrogant ideology that keeps the women second class. A real chuckler, this. Love it! It would have been funnier to Yanks, at least, if Jesus had said “Separate but equal?” in the second panel, since that was the phrase used here to justify racial discrimination from the 1860s (when blacks became legally free and equal) to the late 1950s and early 1960s (when actual equality began to commence to start to arrive). Everything from education to toilet facilities to seating on the bus was “separate but equal” until the U.S. Supreme Court finally broke the legal color line by saying “Separate is inherently unequal”. I have heard that some places when a woman goes to the doctor, he is not allowed to look at her uncovered body, so she is behind a curtain with a female nurse who describes what she sees and the diagnosis is made without the benefit of sight or touch. Something tells me surgery might get complicated. JohnnieCanuck, you also made me chuckle. Am I missing something here? “comments of a sexist nature will not be tolerated”. Should we be talking about Islam at all then? A marriage is a union of one man and one woman, IMHO. Adding ‘IMHO’ at the end doesn’t make the statement any less idiotic. As it’s your ‘opinion’ – and not simply, for example, your ignorant prejudice – you will be able to describe the steps of reasoning (and relevant evidence) that led you to it. I await your explanation with interest. A marriage is a union of one man, one woman and 7-8 sheep, IMHO. So you are all perverted, hell-bound heretics. Except me, my wife and our sheep. my server is down. gimme a new one. I’m bored. also, how about a “What Would Barmaid Do?” shirt? The problem lies in societies giving religion the power of a parallel government. If religion was not allowed to create rules & laws or make us do some things and prevent us from doing other things, religious belief would be laughable and harmless. If there’s one thing all countries should try and put in a world constitution it’s that there’s only one government in each country – with absolutely no role in any form for the religion. T.i.t.m & K: be less ridiculous. SILENCE, Infidel! You son of Cain, who spit on the name of The Lord, by ‘marrying’ in such disgustingly limited numbers! 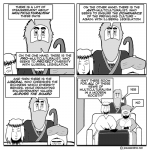 Crusader Rabid – are you conceding you are an ignorant, bigoted idiot? If not, where is the explanation for your ‘opinion’? Aha.. I read it as ‘Crusader Rabbit’. Shesh, silly me! Marital duties do tend keep you up at night, with all those sheep to look after. Just spent the last week reading from the beginning and now I get to make my first post. Been a while since I engaged in high level philosophical/theological discussion. Brilliant stuff! It’s amazing how quickly one becomes desensitized to the idea of “blasphemously” seeing an image of ol’ Mo. I wonder if it still counts as a blasphemous image of Mo when he is completely shrouded in a burka. when the only one husband per woman rule came it was because otherwise it would be difficult to decide who was the father.